Local Search Engine Optimisation and Navigation for online shops is the topic of this 2 part interview. 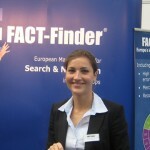 I speak to Katrin Jaehnke of FACT-FINDER to understand how product specific search works, how this is different to your normal Google search and how to customise the results to best optimise an ecommerce enabled website. In part 2, I speak to Karl zu Ortenburg, an Internet Strategist based in London whose company, Internet-Experts-Live, specialises in brand building , social media, search optimisation and visitor to customer conversion. Stay tuned to the end for a surprise announcement, right at the end of this episode. Enjoy.